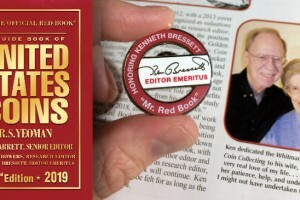 Kenneth Bressett, longtime editor of the Guide Book of United States Coins (popularly known as the “Red Book”), has retired into Whitman Publishing’s newly created position of Editor Emeritus. 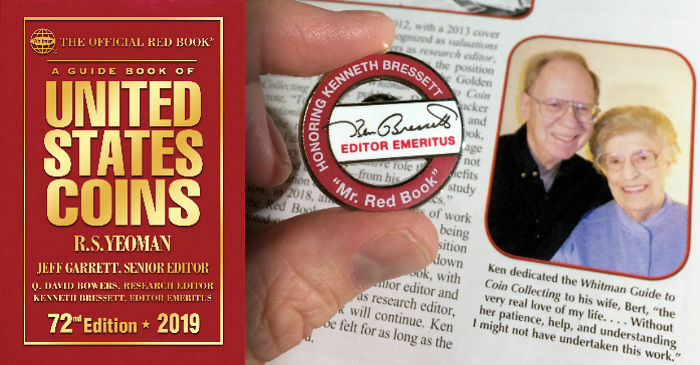 The 2019 (72nd) edition of the Red Book, available now from booksellers and hobby shops nationwide, features a 10-page illustrated tribute to Bressett. In addition, the hardcover format includes a commemorative gold-foil portrait and a facsimile of his famous signature on the back cover. Bressett will make appearances at several shows and events throughout the year to autograph books. Kenneth Bressett, a young collector from Keene, New Hampshire, first met R.S. Yeoman at a coin convention in the mid-1950s. He mentioned several errors he’d found in the latest edition of the book. In 1956 Yeoman invited Bressett to be a freelance editor, and in 1959 Bressett moved with his family to Racine, Wisconsin, to officially join the Whitman Publishing staff full time. He worked closely with Yeoman—by that time one of the most famous numismatists in the world—developing the Red Book and Blue Book and many other hobby references and products. By the time Yeoman retired in 1970, Bressett had taken over many duties as “coordinating editor” of the Red Book. In the 27th edition he was credited as the book’s editor, and in the 66th edition, he was elevated to Senior Editor, with Q. David Bowers and Jeff Garrett assisting as Research Editor and Valuations Editor, respectively. A Guide Book of United States Coins is the world’s most popular annual retail price guide for U.S. coins, tokens, and other numismatic items. 24 million copies have been purchased since 1946, making it one of the best-selling nonfiction titles in the history of U.S. publishing. For the 72nd edition, more than 140 professional coin dealers, scholars, and other numismatic experts contributed their knowledge under the direction of Senior Editor Jeff Garrett, Research Editor Q. David Bowers, and Editor Emeritus Kenneth Bressett. The 72nd edition of the Red Book is available online and at bookstores and hobby shops nationwide. In addition to offering a Large Print Edition and several formats of the regular edition (hardcover; spiralbound softcover; and spiralbound hardcover), Whitman Publishing is also taking pre-orders for the leather-bound Limited Edition (250 copies autographed by Bressett). For more information and to order, visit the website of Whitman Publishing. Whitman Publishing is the Official Supplier of the American Numismatic Association. As a benefit of membership in the ANA, members can borrow the Red Book (and other Whitman books) for free from the Association’s Dwight N. Manley Numismatic Library, and also receive 10% off all Whitman purchases. Details are at the website of the ANA.